UPDATED: NOV 18, 2018 Sweetish caramel notes, very malty with low hoppiness. Overall not for fresh enjoyment. Aroma: caramel, bread. Appearance: golden, clear, no foam. Taste: lightly bitter, medium sourness. Palate: light body, oily feel, average carbonation, no aftertaste. 25cl bottle. pours golden almost no head. Aroma is malty, typical macro lager,some sweet notes, caramel-honey.Taste is sweet, honey, something common like heller bock, malty, hay. Drinkable, but not good. Aroma: caramel, bread, dried fruits. Appearance: clear golden liquid with white head. Taste: light sweetness, lightly bitter, lightly sour, roasted malts. Palate: watery, average carbonation, bitter finish. Can. Pours darker golden in color with a small head. Hay and grainy notes in aroma. Some sweetness too. Bready and bitter in taste. Feels quite thin. Couleur jaune clair, mousse qui disparait. Nez un peu houblonné et céréales. Gout malté avec notes houblonnées typiques de "restes" de houblon et notes poivrées en fin de bouche. Corps leger. Can. Friothy White good mostly lasting head. Yellow colour. light malty and hoppy aroma. Slightly metallic. Light bitter flavor. Again metal-notes. Short light bitter finsh. watery palate. The best beer people in college in France can get. You might receive accolades from homeless people on the way home, but they are just reaffirming your great decision. A pack of 10 is a little over 2 euro and it tastes exponentially better than cheap US beers. 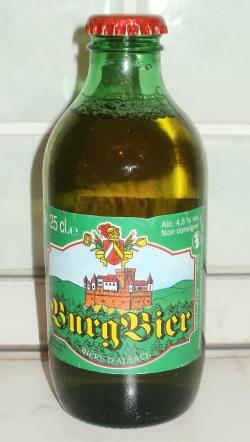 In my apartment we have a saying for this beer: "Berg Bier for life"... we intend to keep this promise. Bottled 250ml. -from Auchan Budaörs. Golden coloured, small to medium sized white head that went away fast, mild malty nose. Sweetish malty, mild corny and touch of grain with watery finish. Like I’ve edpected.